Poor mental health is a widespread problem in Colorado, especially among women, Hispanics and middle-aged people. Coloradans are blocked from getting treatment by cost, fears about social perceptions and difficulty scheduling. Primary care providers play a large role in treating mental health and substance use, and closer cooperation with behavioral health providers may help Coloradans get the treatment they need. Colorado is often celebrated as a fit and healthy state, but when it comes to behavioral health, there’s more cause for concern than celebration. Colorado ranks 43rd in the country for mental health, according to a 2018 index created by Mental Health America. It has the ninth highest rate of suicide in the country, the Centers for Disease Control and Prevention (CDC) reports. And it is the only state where residents are heavy consumers of four different substances: alcohol, marijuana, opioids, and cocaine. It’s clear that behavioral health is a challenge in Colorado. Yet many residents of the Centennial State do not get access to the treatment they need, according to the Colorado Health Access Survey (CHAS), a biennial survey of 10,000 Colorado residents. Nearly one of eight Coloradans report experiencing poor mental health in the past month, according to the 2017 survey. One of 13 said they did not get the mental health services they needed. People with lower incomes are struggling the most. In 2017, these Coloradans reported both the highest rates of poor mental health and the least access to the care they need. 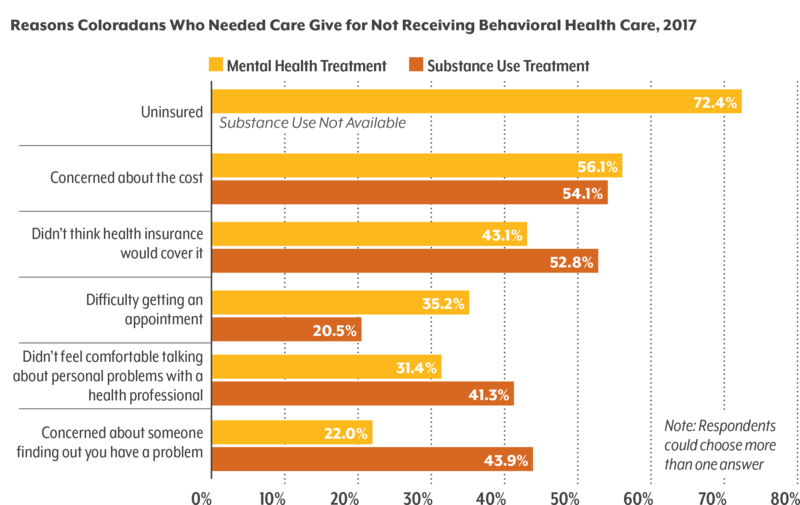 Cost, stigma, and difficulty making appointments are all persistent barriers to treatment for mental health and for substance use. But there is some good news. More people said they were able to access mental health care in 2017 than in 2015, and fewer said they didn’t get care because of the stigma around mental illness. And since 2013, significantly fewer Coloradans say they did not get needed care because it cost too much. This report provides a closer look at which Coloradans report poor mental health and trouble accessing care. It also examines the barriers that prevent people from getting the care they need. Mental health, substance use and behavioral health. What does it all mean? The terms used to describe mental and behavioral health are constantly evolving. In this brief, the term mental health refers to survey questions about mental health, including stress, depression and problems with emotions. The term substance use refers to questions about needing treatment or counseling for alcohol or drug use. The term behavioral health encompasses both mental health and substance use. The CHAS has been collecting information about mental health since 2013. It introduced several questions about substance use in 2017 that focused on Coloradans’ access to treatment. The 2017 CHAS showed 11.8 percent of Coloradans said they had poor mental health, which the survey defines as experiencing eight or more days of poor mental health in the past month. That’s up from 9.9 percent in 2015. The increase could signal that stress and other factors are taking a toll on Coloradans’ mental health. On the other hand, more people may be willing to talk about their mental health challenges. Regardless, the CHAS suggests that at least 600,000 Coloradans had recent struggles with mental health. Can Money Buy Mental Health? People with higher incomes consistently report better mental health. Some 18.7 percent of those whose income is below or just above the poverty line ($16,000 for a single person) reported poor mental health compared with 8.5 percent of those who made more than four times the federal poverty line ($48,000 for a single person). Demographic groups that often face inequities elsewhere in life also tend to report worse mental health. Women and Hispanic Coloradans reported slightly higher levels of poor mental health than the population as a whole, according to the CHAS. Native Americans had twice the rate reported of poor mental health of any other group racial/ethnic group, although the small sample size of the CHAS makes it hard to accurately measure data for this group. The link between economic status and mental health also shows up in how people with different types of insurance report mental health. Medicaid enrollees, most of whom have incomes below 138 percent of the federal poverty line — about $34,600 for a family of four — report the highest rates of poor mental health of any other insurance type, at 21.1 percent in 2017 compared with 9.1 percent of people who are privately insured. Residents of Douglas County, northwestern Colorado, and southwestern Colorado report the best mental health in the state. Those living in Pueblo, the upper Arkansas Valley, the central Eastern Plains, and the region around Gunnison and Montrose report the worst mental health. Those differences likely reflect both real differences in communities’ mental health and in people’s willingness to talk about their mental health. Economics can explain some of the regional differences. Douglas County is one of the wealthiest counties in the country, and high incomes are tied to better reported mental health. At the other end of the spectrum, communities along the Arkansas River — including Leadville at the headwaters and Pueblo where it meets the plains — have faced economic doldrums and also have some of the state’s highest rates of poor mental health. While it’s clear that many Coloradans need support for behavioral health challenges, getting care is not always easy. The 2017 CHAS shows that thousands of people said they did not get the mental health care (7.6 percent of Coloradans or some 382,000 people) or substance use services (67,000 Coloradans) they needed. The true number is likely larger: The CHAS data do not include people who didn’t want or admit to needing services. However, Colorado is doing better than in the past: The percentage of Coloradans who didn’t get needed mental health services decreased from 9.0 percent in 2015 to 7.6 percent 2017, even as the state population grew. This indicates the availability of mental health services may be expanding to keep up with population growth and then some. Many of the same groups that reported high levels of poor mental health also said they did not receive the care they needed. More women said they did not get needed care than men. Native Americans were nearly three times as likely to say they did not get needed care as Coloradans as a whole, though the sample size was small. And a greater share of adults in their 30s and 40s than younger and older Coloradans reported that they did not access needed care. Though African-Americans were slightly less likely to report poor mental health than than white or non-white Hispanic Coloradans, they were more likely to report not getting needed care. As it does with mental health status, income plays a large role in whether people can access care. Some 16.5 percent of Coloradans at the lowest end of the income scale said they did not get needed mental health care or substance use treatment compared with 6.4 percent of those in the highest income group. In northeast Colorado and Douglas County, few people said they did not get the care they needed. People in southwestern Colorado and the Upper Arkansas Valley, on the other hand, report not getting needed mental health services at the highest rates, with more than nine percent of residents saying they did not get needed care. Denver residents also reported higher-than-average rates of not getting needed care. Many factors, including income, insurance, cost, stigma and the availability of providers and appointments could contribute to these differences. For example, Douglas County has the lowest uninsured rate and lowest poverty rates in the state, while southwestern Colorado has some of the highest uninsured rates and highest poverty rates. Many rural parts of the state, including southwest Colorado and the upper Arkansas Valley, have struggled with provider shortages. Other areas have providers, but few that accept Medicaid. 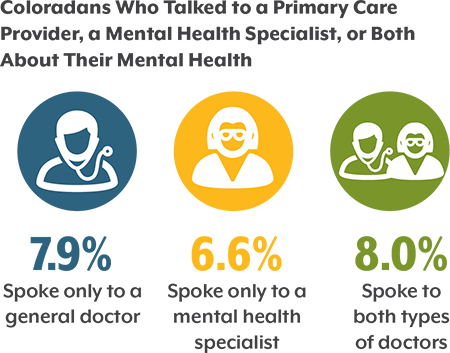 Mental health and substance use are closely related topics, but the services are separate medical specialties, and access differs, according to the CHAS. Cost and coverage are major concerns for people who need care for mental health and substance use. 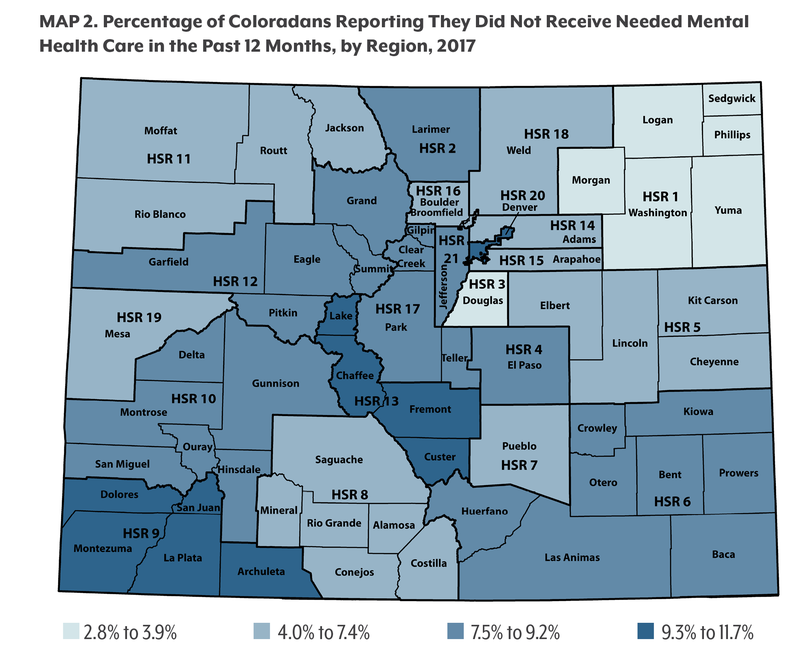 This helps explain the number of lower-income Coloradans who reported they did not access the care they need. It is worth noting since a larger portion of lower-income Coloradans reported poor mental health. More than half of people who said they did not get the care they needed for both mental health and substance use said that cost was a barrier. But this is actually a significant improvement from 2013, when more than three quarters of those who didn’t get mental health care said this was an issue. Insurance coverage was also a concern. More than 40 percent of those who didn’t get necessary mental health care thought their insurance wouldn’t cover it, as did more than half of those who didn’t get necessary substance use treatment. While this is still a significant barrier, it is also an improvement from 2013, when more than half of people thought their insurance wouldn’t cover mental health care. The improvement between 2013 and 2017 is likely evidence of the impact of the Affordable Care Act (ACA), which required many insurance plans to cover mental health services as an essential health benefit and which expanded access to Medicaid, which also helps cover mental health services. More people who had private insurance were concerned their insurance would not cover mental health care. Among the privately insured, 52 percent thought mental health care might not be covered compared with 32.7 percent of those with public insurance. This is likely because most public insurance plans cover mental health services — but some private plans still do not. While mental health and substance use services are considered essential health benefits under the ACA and Colorado state law dictates that many plans must cover behavioral health services, some private plans are exempt from the state’s requirement to cover these services. Some groups were more likely to report stigma than others. Nearly half of men (46.6 percent) who did not get mental health services said that they were concerned about someone finding out they have a problem. Just a third of women (32.2 percent) reported the same. Stigma was a particular barrier for people struggling with substance use: 43.9 percent of people who said they didn’t get needed substance use treatment said they worried about someone finding out they had a problem compared with just 22.0 percent of those who said it was a barrier for mental health. A Role for Primary Care? In Colorado, it is harder to get an appointment for mental health and substance use than for primary care, according to the CHAS. 20.5 percent of those who couldn’t get needed services for drug or alcohol use said it was because they had a hard time getting an appointment. 35.2 percent who couldn’t get needed mental health services said it was because they had a hard time getting an appointment. Meanwhile, just 11.1 percent of Coloradans didn’t see a general doctor because of difficulty getting an appointment. Of those who couldn’t get needed behavioral health services, 70.2 percent did see their primary care doctor within the past year. 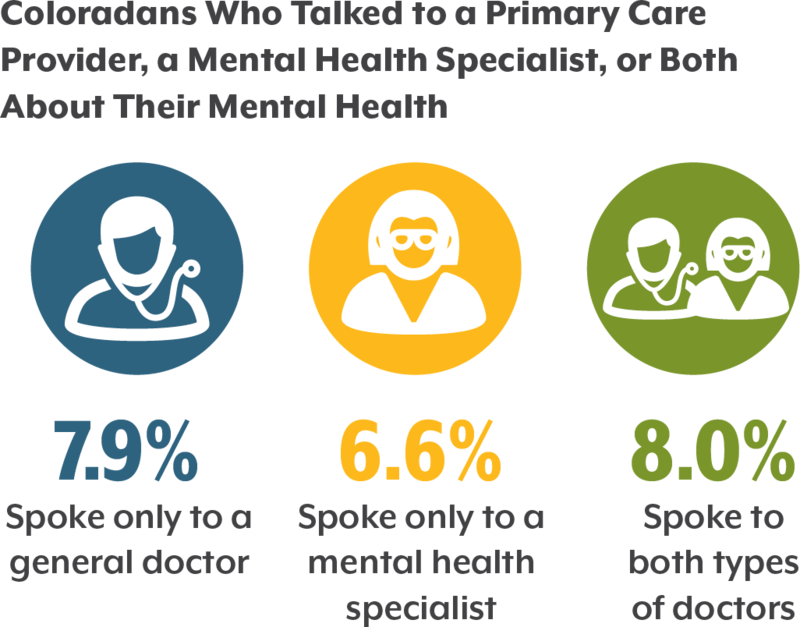 So maybe it’s no surprise that more people are talking to a general doctor about their mental health (15.9 percent) than to a mental health provider (14.6 percent). This points to the potential benefits of physical and mental health professionals working together on their patients’ health. In Colorado, more health organizations are moving toward a model called “integrated care,” in which health care professionals from different specialties collaborate. Mental health and physical health are strongly linked. People in poor physical health report poor mental health (33.7 percent) at four times the rate of those in good physical health (8.3 percent). The reverse is also true: People in poor mental health report poor physical health (39.0 percent) at four times the rate of those in good mental health (10.3 percent). The connection between the two seems to point both to the stresses than can come along with health challenges and to the toll mental health challenges can take on the physical body. It also suggests that there may be benefits to approaching physical and mental health holistically. Behavioral health is complex, and tracking Coloradans’ experiences with it can pose challenges. 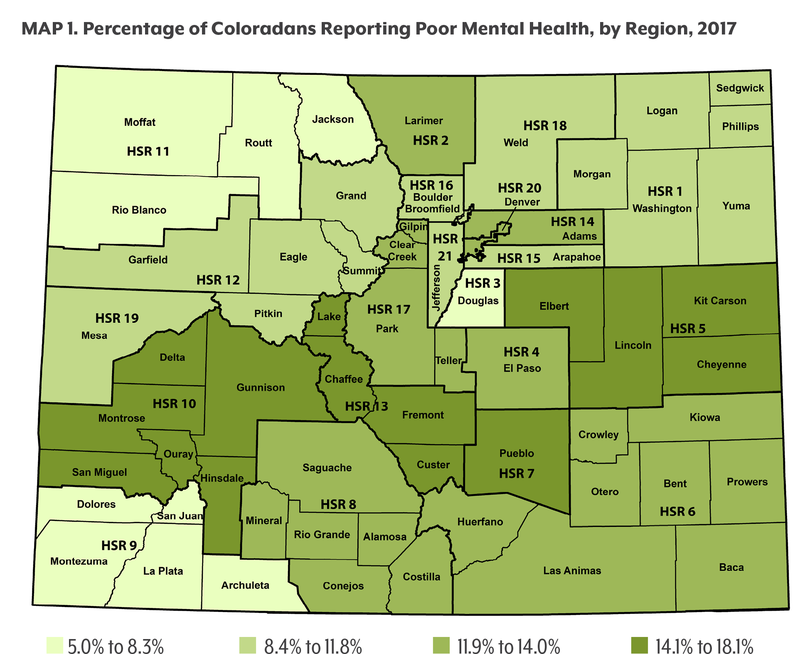 The CHAS suggests that more Coloradans are struggling with their mental health, and that a significant number don’t have access to the care and support they need to improve the situation. Coloradans with lower incomes and without insurance, those who are not white, adults in their 30s and 40s, and women report particularly high levels of vulnerability. Coloradans say that behavioral health treatment can be harder to come by than support for physical health. The cost of behavioral health care, the availability of appointments, and stigma — particularly around substance use — are persistent barriers. And yet the data point to a strong connection between physical and mental health. Colorado’s growing numbers of drug overdose fatalities and suicides show that, without support, the consequences of mental health struggles and substance use can be dire. Understanding and providing appropriate care for behavioral health is a critical part of improving overall health in Colorado. Policymakers, health care organizations and others are working to expand access to care and help improve the systems that patients use to find care. Major statewide efforts focus on integrating behavioral health into primary care — a move that might help improve access and encourage patients to discuss behavioral health with their primary care physicians. Other initiatives focus on bringing needed substance use prevention, treatment and harm reduction efforts to more parts of the state. Still others bring providers to underserved communities, raise awareness about mental health, and help people navigate the complex behavioral health system. As new efforts move forward, the CHAS will help track how they are affecting access to behavioral health care and, eventually, the mental health of all Coloradans. 5 The federal poverty level in 2017 for a family of four is $24,600. Special thanks to the Colorado SIM Office for funding this research. The project described was supported by Funding Opportunity Number CMS-1G1-14-001 from the U.S. Department of Health and Human Services (HHS), Centers for Medicare & Medicaid Services (CMS). The Colorado State Innovation Model (SIM), a four-year initiative, is funded by up to $65 million from CMS. The content provided is solely the responsibility of the authors and does not necessarily represent the official views of HHS or any of its agencies.